There is a sense of nostalgia when one visits a true landmark venue in London. History, glamour and a feeling of wondering which famous shoes have walked the same steps as you take often fill the mind. The Savoy Hotel is one such venue in the capital and its restaurant – Kaspar’s At The Savoy – is our focus for the discerning gent on this occasion. The restaurant launched a new menu at the end of May 2018 that centres on seafood and earthly flavours. Alongside the anticipated range of seafood is the usual grill section so there is wide choice to suit all tastes. 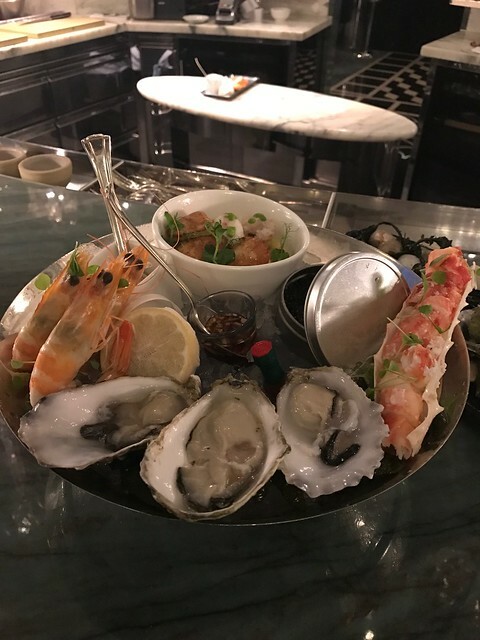 Given the evening was focused around seafood, our starters, titled ‘Best of the Seas’ (£65 per person) embraced the trend, featuring British oysters and mussels, Keltic scallops, Bering Sea King Crab, Scottish Langoustines, Mediterranean prawns and Avruga caviar. It is quite the sight arriving at the table and the eyes already start to feast before the mouth tastes. If sat at the centrepiece bar, the discerning gent will have the benefit of witnessing the chefs create such masterpieces too. 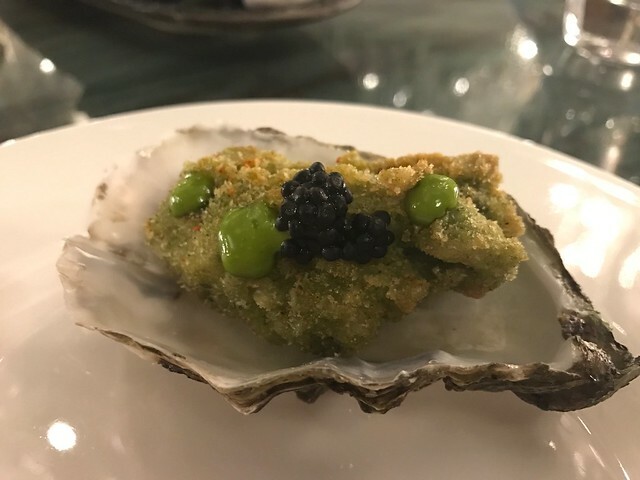 Another starter tip would be the fried Mersea oysters with caviar (£12). After working through the seafood starter like a culinary tour of the European seas, it was apparent to see the theme of the new menu take shape. Phrases such as ‘Drawn from the Sea’ and ‘Raised in the Fields’ etc. are mentioned frequent and Elysium Magazine can see why. Time has been taken by the restaurant team to carefully curate a menu that focuses on the origins of the food and its delivery on the plate. Once starters were devoured, it was time to think about the mains. As previously mentioned, the focus was on seafood so it would be rude not to continue the trend. 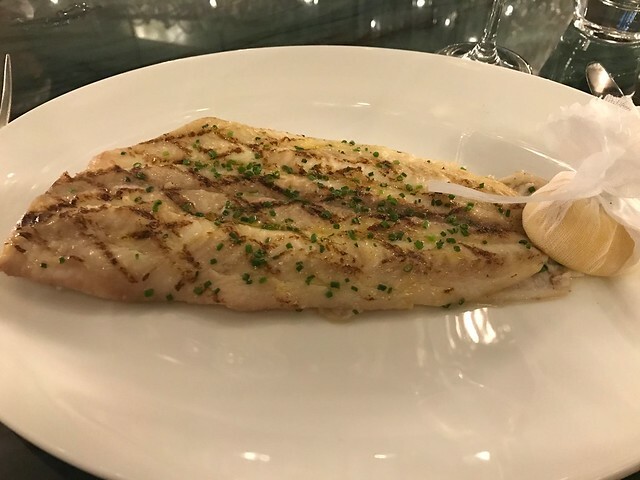 Newlyn Dover sole (£40), pan seared and served with a brown butter and caper sauce, at the recommendation of our waiter delivered on the taste-front. A sizeable slab of a fish, perfectly cooked and dripping with buttery intent. Other recommendations include the Campbell Brothers Ox Cheeks (£29), North Atlantic Halibut (£38) with burnt mussel fumet or Irish Black Angus beef fillet (£45). There is plenty of choice to suit appetite or palate. Washed down with copious amounts of champagne was the only way to see out an evening at Kaspar’s and the restaurant as this in plentiful fashion. If you have the space and appetite to face the desert menu, there is a good selection of very different sweet-toothed treats to pick such as salted caramel puff pastry with vanilla cream or Guariguette strawberries served as a popsicle (both £10 each) amongst a few others. With the piano playing in the background Kaspar’s is certainly a venue that will impress on the grandeur – be it client entertaining or an evening to wow your other half. Part of the allure of dining out is the theatre of the experience, but what you will always remember most is the taste of the food and thankfully Kaspar’s delivered where it matters most.